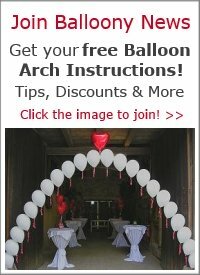 Photos of wedding decorations with balloons WANTED! Whether you created the decor yourself or had it done for you, we invite you to share a picture of it with our readers. The photo can also be from a birthday, anniversary or any other event... as long as it has balloons in it. 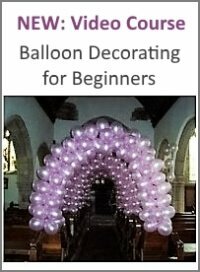 There are many different ways balloons can play a role in the festive environment of a wedding. Show us what role balloons played in YOUR wedding. Sometimes ideas come through the strangest of inspirations... so, if you have a beautiful balloon decoration photo NOT from a wedding, please submit it as well. Your decor might just be what future brides & grooms are looking for! Jump down to submit your photo now. As our photo gallery grows, we will feature some of the best ideas for decorating for a wedding. Balloons come in all shapes, sizes, and styles, so you are not limited to one "look" just because you choose balloons for decorating. Another reason brides love wedding reception decorations with balloons is they can be as simple or complicated as you would like. If you have chosen a simple wedding theme and the bridesmaids will be wearing plain black and white gowns, your decorations can be just as elegant. For an evening or New Year's wedding, sprinkle a few gold metallic balloons with the black and white ones. If your wedding will be less elegant and focus more on a party atmosphere, you can choose a variety of brightly colored balloons to suit your theme. 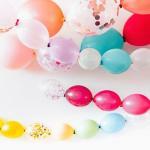 Colors can still match gowns, cakes, and other accessories, but you can punch things up with metallic or mylar balloons. Mylar balloons come in festive shapes like hearts and stars so you can add a special flair to the look of the reception. Balloons are also an affordable way to decorate. Flowers are usually very pricey and can be difficult to work with, especially if you need to move them from the church to the reception. 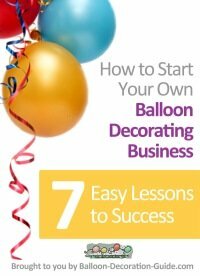 There are endless ways to decorate weddings, birthdays, anniversaries, bar mitzvahs, corporate events and more with balloons. We'd love to see YOUR CREATION. Our gallery features new ideas and old favorites, and is a great place to start if you are planning your wedding decorations with balloons. 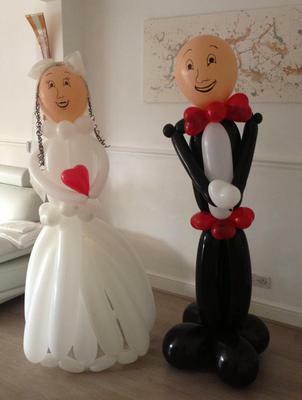 Which Balloon Decorations Made YOUR Wedding Special? Submitting photos of your wedding or other balloon decorations is free and easy. Just fill in the form below, upload your picture, and hit the submit button. Your photo will become a "live" page on this site and we'll add it to the slide show above. You may upload as many pictures as you want, using a new submission page for each one. Or you make a slide show with your favourite photo sharing program (e.g. Picasa, Flickr or Slide.com). Following their directions, put the embed code in the "tell us about it" area, below. There's no need to upload pictures if you use a slide show. Please add a picture of you balloon decoration. Click the button and find it on your computer. Then select it. One of our customers requested these Mickey and Minnie Mouse balloon sculptures for her children's blessing. Hi Naveen, Many thanks for sharing this photo with us. What a lovely combination of balloon columns and arches to celebrate a first year birthday. Princess Balloon Column! My favorite part was her hair! Great for any occasion. My Balloon Decoration is a Table Top Column for a Bridal shower.